The ABCD Diaries: Get Geared Up for Summer's Most Celebrated Holidays with "Summer Countdown" by Amy Puetz! Get Geared Up for Summer's Most Celebrated Holidays with "Summer Countdown" by Amy Puetz! "Do the summer holidays slip by before you have a chance to really celebrate them? Are the summer months so full you don't have time to sit back and relax? If you answered yes to either of these questions, then this wonderful book will brighten your family's summer. 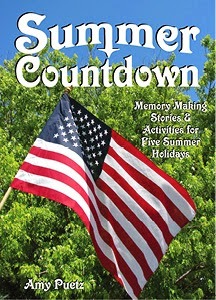 Summer Countdown has family friendly stories and activities for five summer holidays: Mother's Day, Memorial Day, Flag Day, Father's Day, and Independence Day. Imagine your family reading a heart-warming holiday story and then participating in a fun activity together during the summer months. This will be made simple for you with Summer Countdown! The book is broken up into daily sections. Each day has a story and an activity that will take about 30 to 45 minutes. Most of the stories in this book were written in the 1800s and early 1900s. Some of the language may seem old fashioned, but this only adds to their charm! Many of these stories have not been reprinted since their first publication, and are just waiting to be rediscovered by a whole new generation. Summer Countdown will appeal to any age group, but children ages 6-14 will enjoy it the most. Each story can be used to teach important lessons to your children. Reading aloud as a family will open up wonderful opportunities for discussions and conversations. The activities include: Games, Crafts, Cooking, Quizzes, Patriotic Songs and Short biographies of the Signers of the Declaration." What we thought: These fun lessons are interesting and engaging while also being highly educational. Both homeschoolers and non-homeschoolers alike could use the Summer Countdown lessons to teach their kiddos about each holiday and moms and dads will probably learn something along the way! We love the these lessons include hands-on activities as well as great stories from some of history's most interesting writers. We really enjoyed the Summer Countdown book by Amy Puetz! You can get Summer Countdown for just $14 for an ebook or a printed book. Find a sample chapter and order your Summer Countdown today!